It's September and I am feeling a bit for a WWII, British Paras action. In this blog entry, a beleaguered Para has German infantry closing on his position. 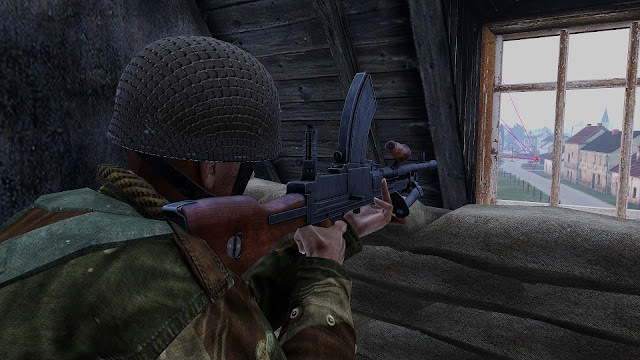 The attic from hell: I fortified the position with some sandbags and placed my character in a keyhole position. Two German squads are advancing (not a fat chance to get out alive, I know). The point I want to make is that one has to be proactive in a defensive position. 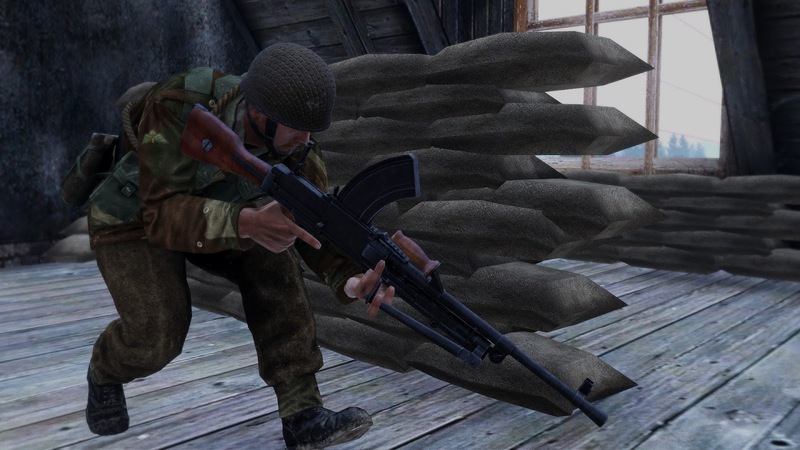 A common mistake that I see in people playing Arma 3 is that they fire, duck into cover and just go up again for a second shot from the same exact position. The enemy knows your latest position and he will be aiming right into your head when you come up. My first shots were through the left of the window, so the house's roof protected me against observation and fires from Germans advancing left of the road. 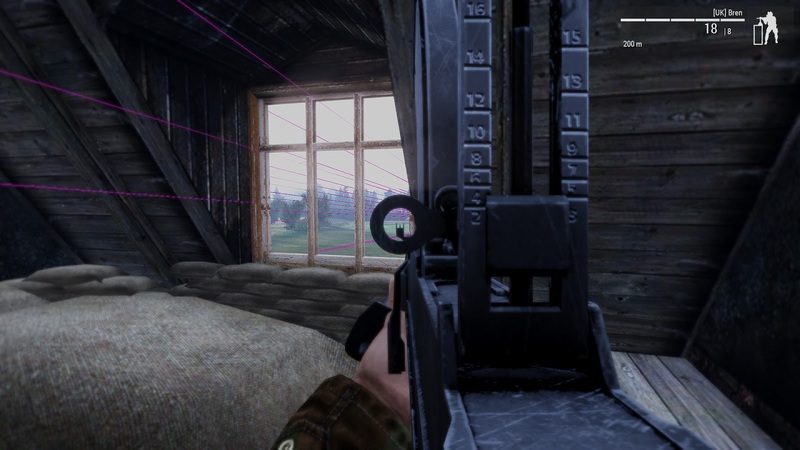 One MG 42, immediately acquired and started firing (note the bullet traces). 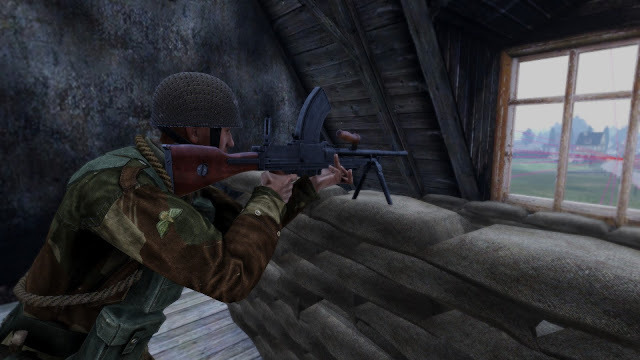 I added some bullet tracing for this German MG42 because I wanted to know if my sandbags placed against the wall would provide some extra stopping power. It turned out that the bags were not necessary. Once the enemy starts putting rounds near you, he has you in his sights. Move out to the right side of the window. I'm in the attic of the house in the forefront, facing towards the screen. When I moved, the MG42 shifted his fire violently. Not the greatest aim, I should say. My shifting to the right allowed me to check for enemy activity on the left. Note the MG42 still blasting. 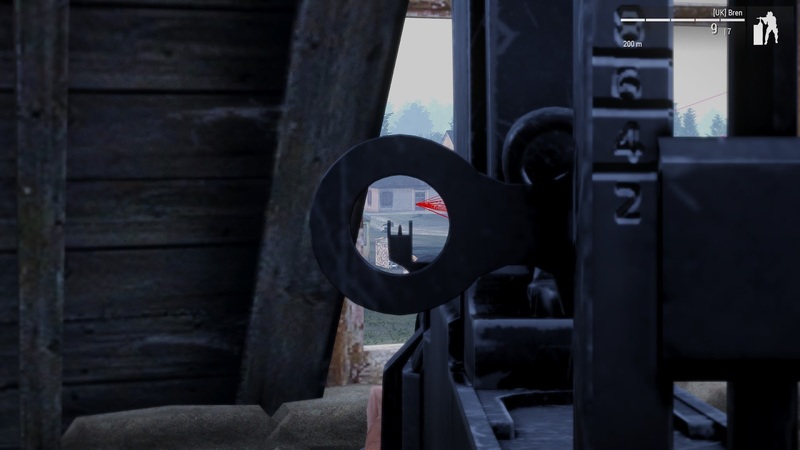 Now some rounds are making it through the window. 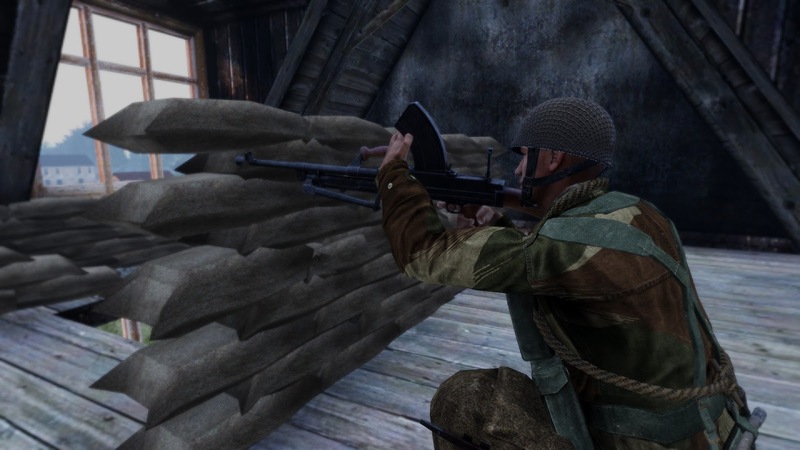 Eventually, I had to move to my left to acquire the pesky MG42. 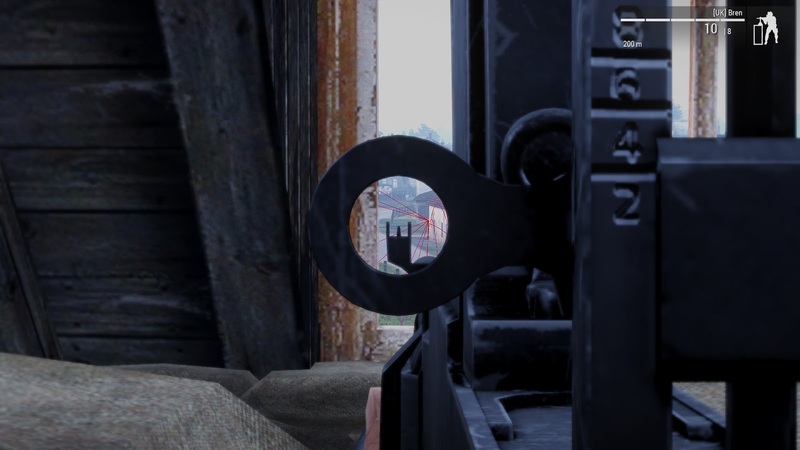 The German was peeking around a corner. I could not hit him. And off course, take cover while reloading. The Germans chose my right flank to creep onto me. 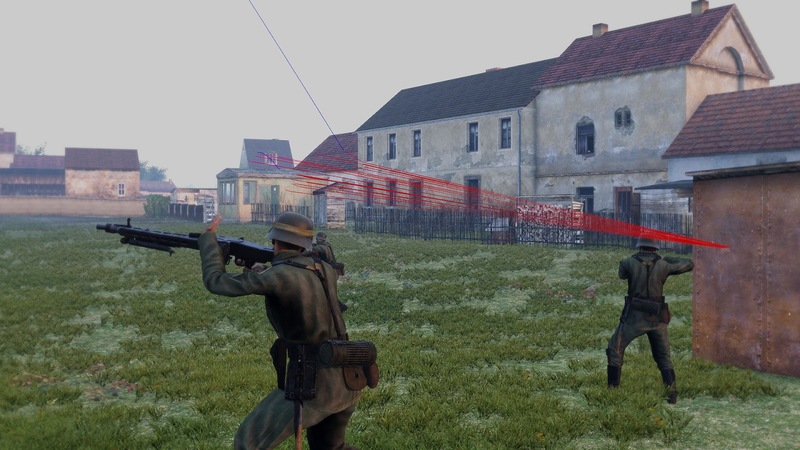 The red traces are from the MG42 in the foreground, which just moved. Catching up with the enemy MG42, exposing myself as little as I could. Until I dropped him. Ironsight fun. And off course, I got caught. When I slowly shifted to my right, I was greeted by no less than five K98s. Not a fat chance of survival. Nice looking mod, the critic to the player of arma is true to every FPS, which made them targets, but it's more a discipline thing, because a good spot can get you fixed into keep firing from the same place. Defending a fixed position, any SAW is the bane of your existence. 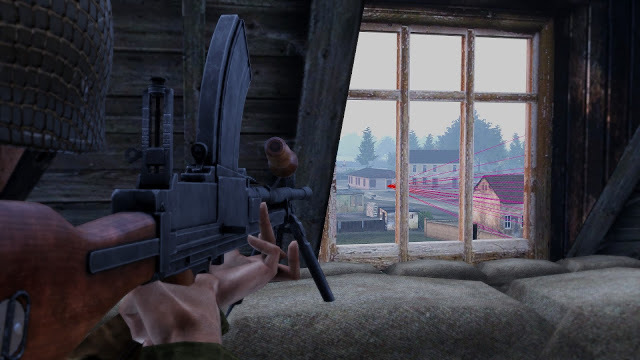 I can handle large numbers of enemy AK shooters, but when the RPK-74s and the PKs get dialed in, you best move to a new position. Also playing in built up areas is tremendous amounts of fun. Even the armed civilians faction of CUP, the Chedakis, become a real challenge. 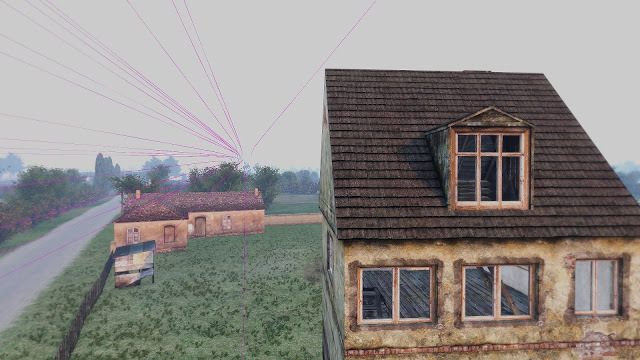 Their snipers just love take pot shots at you with their scoped CZs. The key to survival in this case and in WWII is to keep moving and keep your head on a swivel.